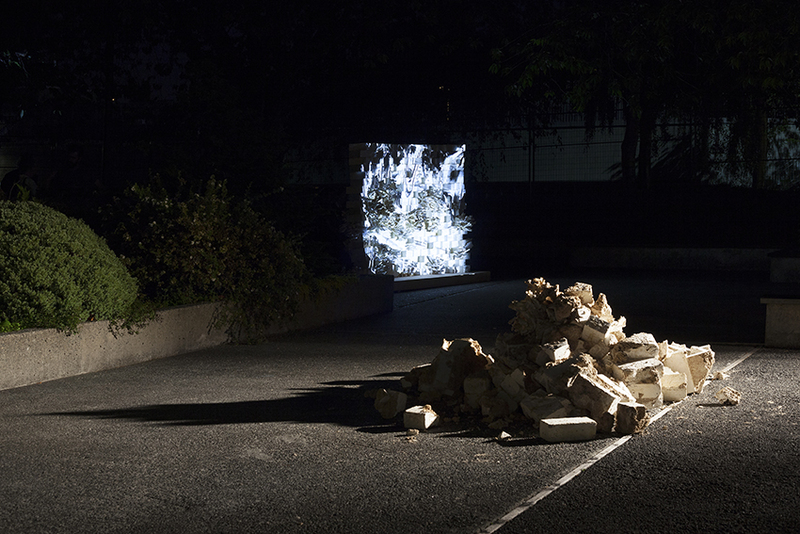 Installation view of Mycelium Mockup, Museum of Vancouver, 2015. Courtesy of Krista Jahnke. 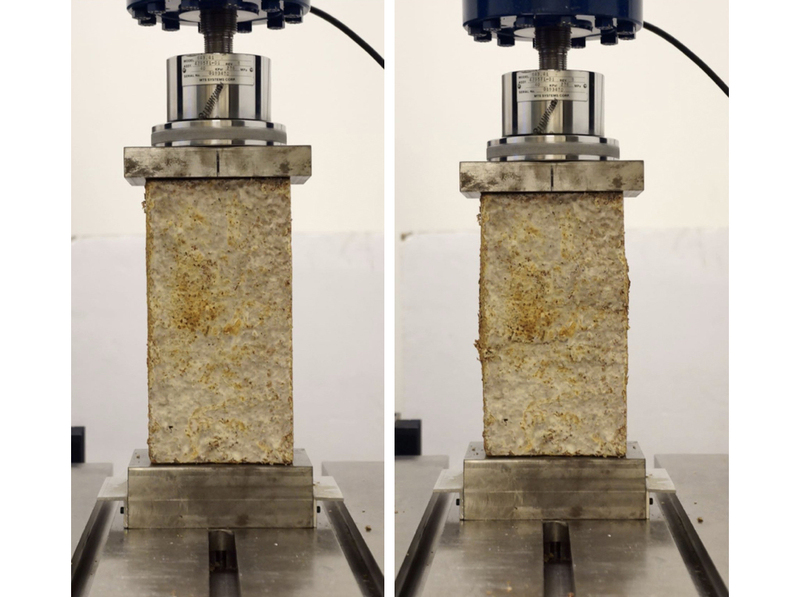 They Grow Without Us is two-year research project exploring the possibilities of mycelium biocomposites as an alternative to polystyrene foam in architecture. Globally, 40 percent of all resources are consumed to construct buildings, and there is a growing awareness about the environmental impacts and health risks posed by architectural materials. Polystyrene foam, which is widely used in buildings as thermal insulation, poses a number of risks to our environment and our bodies. Thermosetting, the process in which styrene beads are converted into the familiar white and blue foam, requires the use of hydrochlorofluorocarbons—chemical compounds proven to be harmful to the ozone layer.1 Polystyrene foams are resistant to biodegradation, and can last up to hundreds of years in landfills. On a human scale, the neurotoxicity of styrene is well-documented—it is also a likely carcinogen suspected of effecting human fertility. Despite these harmful impacts, building and construction in the United States between 2003-2007 consumed an average of 140 million kilograms of polystyrene annually, which accounts for only 5 percent of total annual production for all uses.2 Mycelium biocomposites, the scientific term for materials made of mushroom roots, sawdust, and other cellulosic material, deliver thermal resistance and strength similar to that of polystyrene with a fraction of its environmental impacts or health risks. They can be grown from natural materials with no additional chemical inputs, producing fully biodegradable materials that add to regional ecosystems at the end of their life. They Grow Without Us suggests a future in which living architectural materials respond to needs that are at once aesthetic, structural, and visceral. 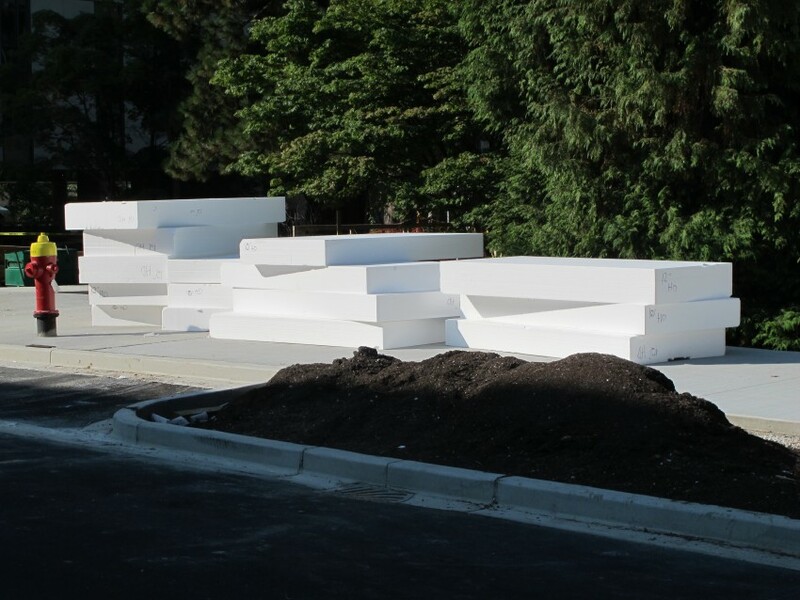 Geofoam awaiting use in Vancouver. Courtesy of AFJD. 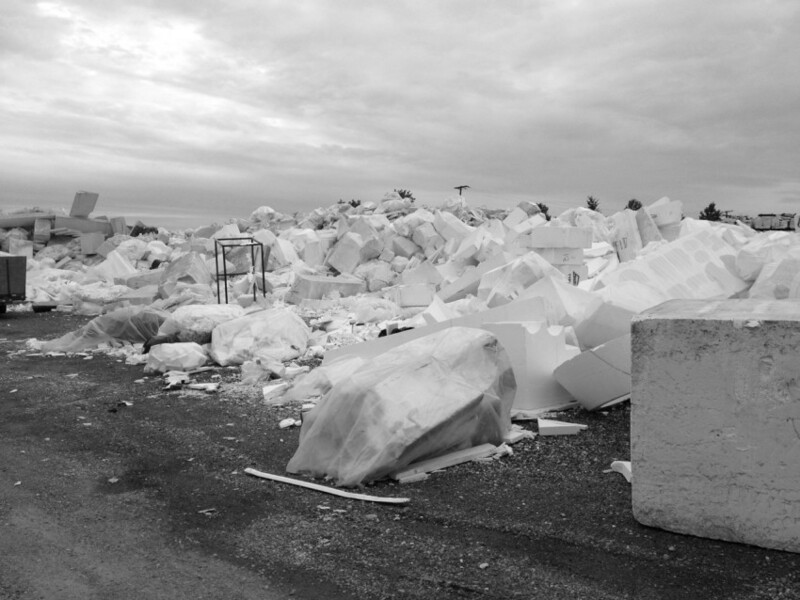 Recycle yard for polystyrene waste at Mansonville Plastics, Abbotsford, British Columbia. Courtesy of AFJD. 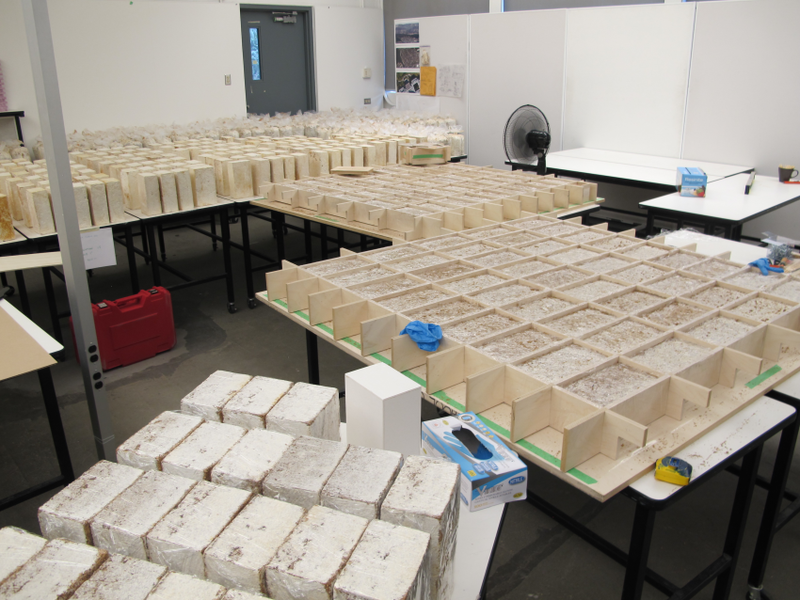 Molding mycelium biocomposite into bricks, University of British Columbia (UBC) design studio. Courtesy of AFJD. The research university offers the discipline of architecture a useful platform or cultural habitat, to borrow philosopher Isabelle Stengers’ term, from which to speculate about its own future. At first glance, this habitat is blissfully unaffected by the pervasive economic, legal, and procedural pressures exerted by the profession. However, shifting from a professional to an academic context means exchanging one set of demands for another. The hard sciences, which currently dominate university research funding and largely dictate its norms, are in fact subject to considerable economic and bureaucratic pressures—in no way are they located in a domain sheltered from these pragmatic concerns. According to Stengers, we might best understand contemporary scientific inquiry as “big science,” which is a new kind of undertaking characterized by “international financing, the construction of large-scale instruments, management of an experiment of several years, the organization of large numbers of colleagues, the division of labor…”—a project that reduces the scientist to a “cog in some more or less extravagant large-scale undertaking.”4 The pressure to produce measurable results, writes Stengers, favors incremental progress over broad questions. The proposals that results are safe, addressing an ever-growing narrow set of technical questions, rather than deeper forms of conceptual inquiry with uncertain potential outcomes. This shift reduces our capacity to think critically about the new realities made possible by scientific research. The technical and conceptual ambitions of They Grow Without Us fall on both sides of this categorization. 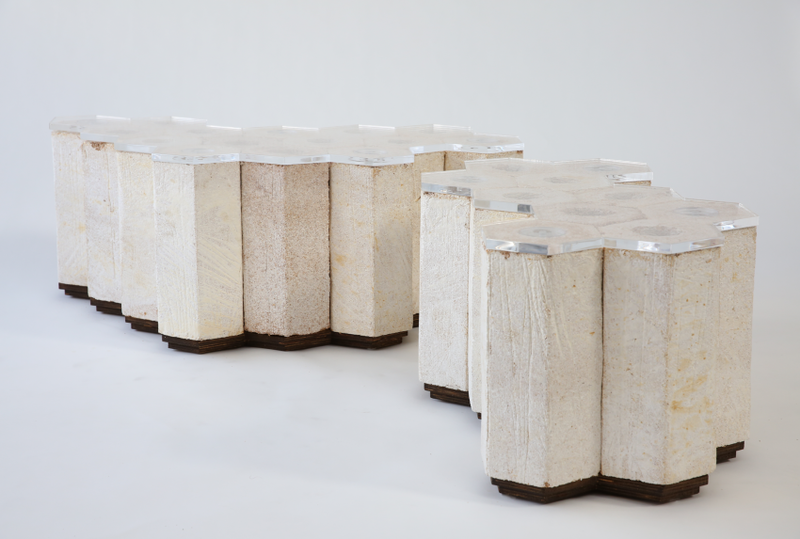 The initial phase of the project was dedicated to the production of standard mycelium biocomposite cylinders, which were crushed to produce discreet data about the compressive strength and durability of the material. This aspect of the project operated well within the bounds of scientific research, qualifying the project for generous funding allocated to the technical development of sustainable materials. The speculative architectural installations that followed (and that were possible only because of this technical research), on the other hand, did not easily fit within the categorizations of scientific evidence or performance criteria. Couching the conceptual side of the project in technical terms did little to secure additional funding, which meant that we had to pursue arts funding instead for the more theoretical materializations of the research. The flexible representation of a project is familiar to any architect who uses design commissions to pursue their own agendas alongside client desires. Speculative design research, not reducible to evidence-based science or design services, fits uneasily between the market demands of the academy and the profession. Stengers argues that a plurality of coexisting approaches is necessary to diagnose and perform new forms of existence made possible by scientific activity. Rather than an approach to knowledge production that places physics over other branches of science, or scientific inquiry over other forms of thought or discourse, she advocates for an ecology of practices—a situation in which competing versions of truth coexist alongside, across, and outside of the scientific discipline. Stenger’s “big science” offers a compelling analogy for contemporary architectural practice. Just as the funding of “big science” reduces broad questions to narrow technical concerns, “global practice” flattens architecture to an iconic image that frequently fails to engage either the quality of the interior spaces that it contains or the character of the urban experience it produces. 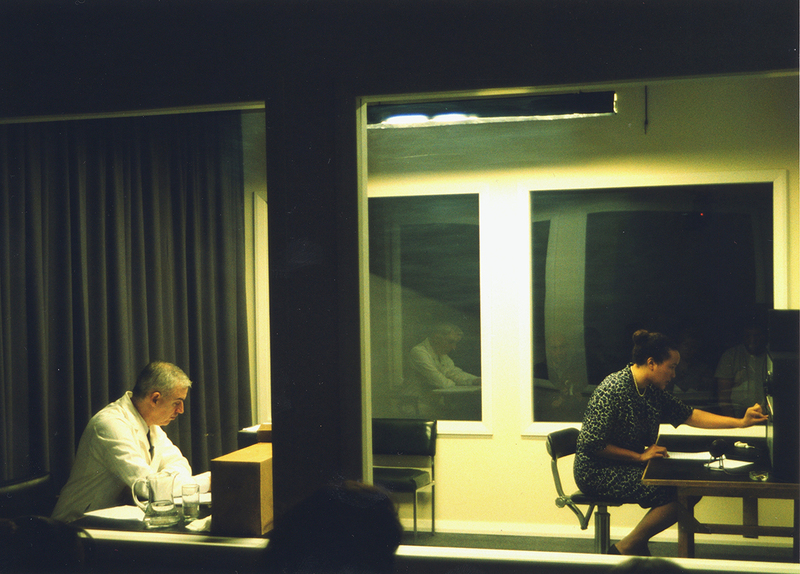 If the coexistence of multiple perspectives across scientific and discursive disciplines can act as an antidote to narrow objectives, it is also likely that the coexistence of speculative design research, a stubborn outlier irreducible to performance criteria or other forms of “truth-production,” among more pragmatic and narrow technical research approaches within academia and the profession, also holds the promise of engaging broad questions related to the future of the discipline. Unconfined compression test, UBC Centre for Advanced Wood Processing. Courtesy of AFJD. The initial technical objectives of They Grow Without Us were fairly straightforward: grow mycelium biocomposites and characterize their basic attributes through material testing. Samples were produced by sterilizing Red Alder sawdust with heat to remove undesired microorganisms. The sterilized substrate was then mixed with nutrients, inoculated with mushroom spores, and incubated to encourage the growth of mycelium, the threadlike root of mushrooms. Mycelia, which are biological polymers, colonize the substrate—producing a cross-linked three-dimensional matrix of structural polysaccharides in its interstitial spaces. Once colonized, the substrate was molded into shapes, typically less than half a cubic meter in size due to biological limitations in the growth process: larger volumes are prone to contamination by mold and other undesired microorganisms, which outcompete the mycelium. This is likely due to a buildup of carbon dioxide, which has been proven to inhibit mycelium growth rates, as well as introduce contaminants. Infected samples crumbled immediately after they were removed from their molds, whereas the healthy samples had developed sufficient strength to remain intact after several days. At this point, the healthy samples were subjected to elevated temperatures intended to dry and kill the mycelia in order to prevent the future unintended growth of the material. In the end, the blocks resembled, both in approximate strength and thermal resistance, rigid polystyrene foam. 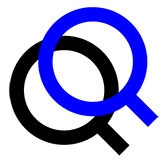 Emergent materials amplify the feedback loop between design and matter intrinsic to any design process that engages physical materials. Mycelium biocomposites are grown rather than manufactured, inverting the typical relationship between raw materials and the energy processes used to convert them into building components. 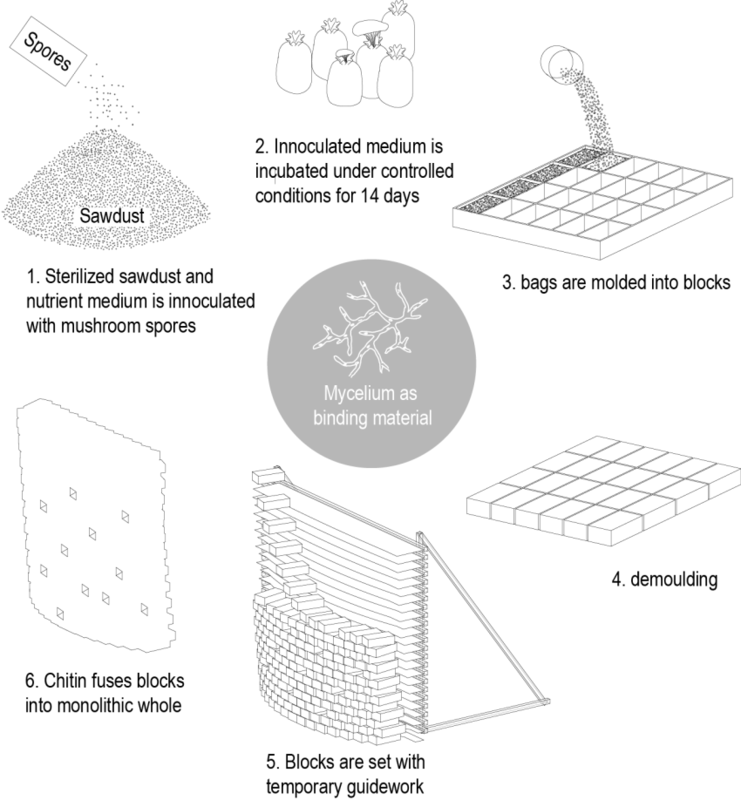 Biocomposite blocks replace the exosomatic energy-intensive process of manufacturing styrene with the metabolic process of growing organic mushroom material. They Grow Without Us tests the temporal limits and potentials of this metabolic process. Rather than halting the growth process at the end of the component, the project explores the possibility of controlling it. We moved to a deliberate model of “growth” in which modular components could continue to grow into monolithic wholes made entirely of organic material. No chemical binders were required to produce larger architectural results—marking a departure in the production of architecture from the deliberate (and perhaps traditional) assemblage of inert materials to the cultivation of living materials. Working with living material allowed us to explore concepts related to the full spectrum or cycle of life, from growth to decay. 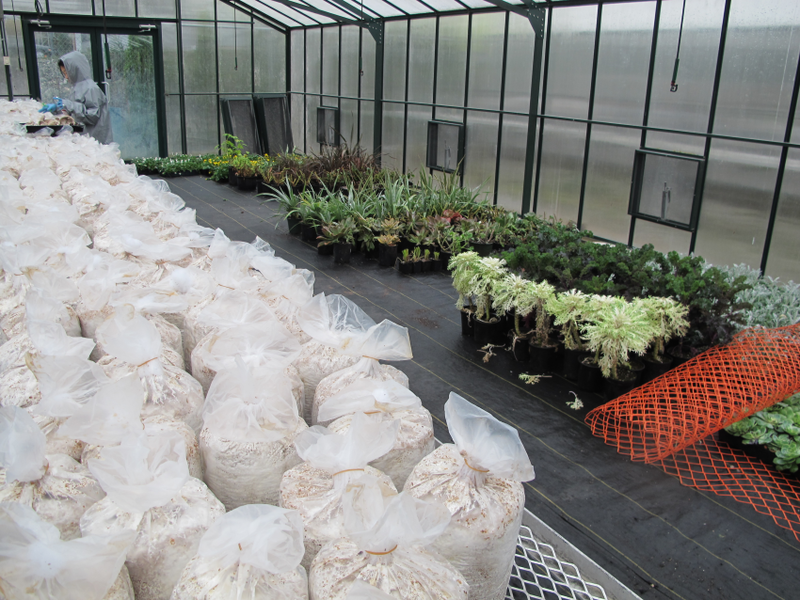 Cultivation of mycelium biocomposite, UBC Greenhouse. Courtesy of AFJD. 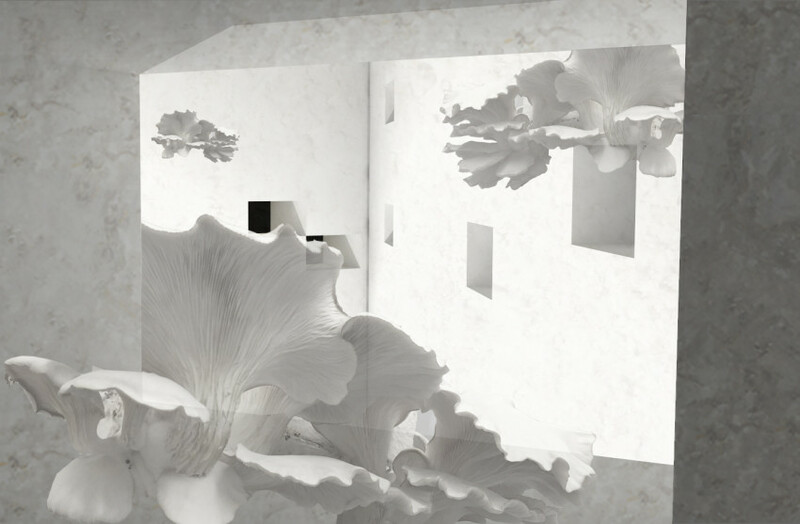 The cultivation of mycelium and the cottage production of mycelium materials unfolded across a variety of spaces in response to certain pragmatic requirements. The project was initially carried out in a former IT closet; it moved to a vacant design studio; and finally ended up in a 1,400 square foot greenhouse to accommodate the need for increased space, ventilation, and humidity. In an ethnographic study of scientists, Laboratory Life, Bruno Latour and Steve Woolgar examine the ways in which the laboratory itself influences the production of scientific facts.5 We can understand this most obviously in the initial cultivation of blocks that took place in the UBC design studio, which was inadequately ventilated, requiring us to cut growth cycles short (prior to the assembly stage) to protect research assistants from spores produced by unchecked growth. Moving the project into the greenhouse provided better air circulation and proximity to the outdoors, which enabled us to experiment with living blocks and assemblies. However, still, the biological needs of the mushrooms had to be protected from climatic extremes and harmful microbes produced by the adjacent composting facility. The rapid growth rate coupled with the seemingly unpredictable biological responses to the environment inverted the typical relationship between architecture and nature. But the meso-environment of the shaded greenhouse also changed the nature of the project in ways less explicitly pragmatic. The earthy smell of mushrooms growing in the dim twilight of their natural habitat induced a desire to care for these living organisms and a willingness to simply let them grow according to their own logics. The seemingly idiosyncratic growth patterns of mycelium captivated us, and pushed our design process in new ways. However, despite this compelling period of cultivation, producing a product for market requires trading cottage production for more efficient commercial methods and economies of scale. What happens when cottage industry gives way to industrial production? What costs incur? Molding of mycelium biocomposite into hexagonal blocks, UBC Greenhouse. Courtesy of AFJD. 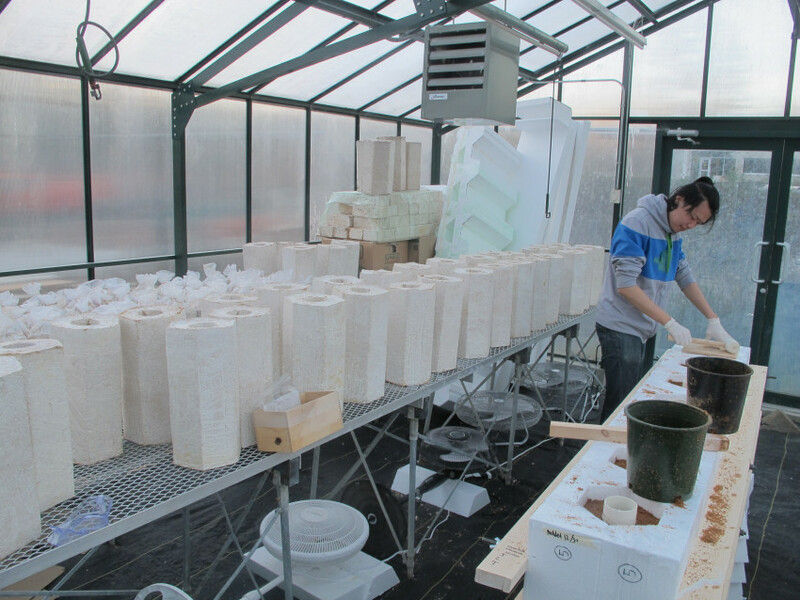 Producing mycelium biocomposites is a specialized agricultural operation—managing the “positive” transition from cottage production to scaled-commercial operation means avoiding the mistakes of large-scale agriculture. Consider the evolution of agricultural production in North America: the nineteenth-century farm was a model of self-sufficient resilience and productive relationships with local ecosystems. In contrast, the industrial logics of contemporary agriculture have typically relied on genetically engineered crops in conjunction with designer pesticides and fertilizer distributed by large machinery—wringing out every ounce of the territory at the expense of the soil and every other organism that depends on it. However, despite the well-documented abuses of industrial agriculture, it would be a mistake to romanticize pre-combustion agriculture, whose closed ecological loops were tended to by labor determined by race and gender. The conflict between these cultivation methods and what they yield is more complex than placing a back-to-the-land conservationist perspective against an accelerationist one. Through They Grow Without Us, we were able to glimpse the complexities and less savory aspects of industrial mushroom cultivation, like the need for highly specialized industrial environments to maintain the production rates of monocultures susceptible to contamination. At the same time, the project revealed the potential of combining biotechnology with local knowledge and ecosystems—potential that hinged on developing systems of accountability for the holistic design and production of new material technologies. A detail of mycelium propagation at block surface. Courtesy of AFJD. It should not come as a surprise that efforts are already underway to genetically engineer mycelium with commercially desirable attributes. 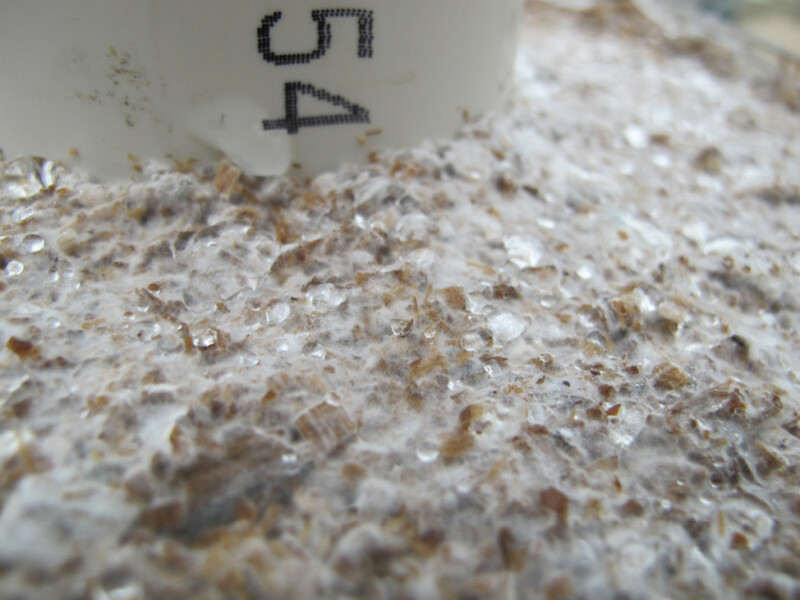 Research is being conducted to increase mycelium’s growth rate and resistance to competing microorganisms, as well as to optimize the production phase, reducing time and possible contamination in the mold. 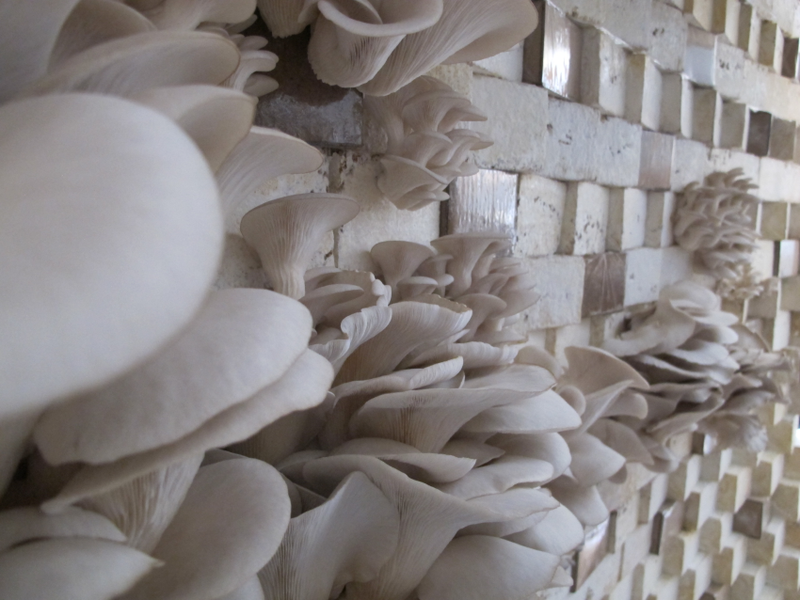 Likewise, the ability to grow higher performance building-envelope components from mycelium will depend in part on the ability to increase its thermal resistance, durability, and resistance to moisture. However, beyond simply optimizing performance, They Grow Without Us imagines the possibility of genetic alterations that enable mycelium to exist in a dormant state during the life of the building and to be reawakened upon demolition. 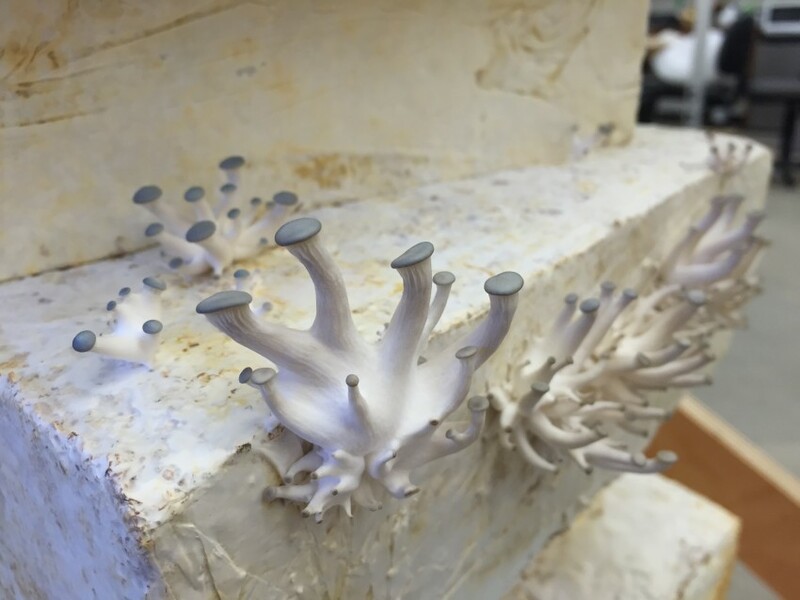 The genetic modification of fungi provides alternative pathways—certain genetic controls could be manipulated to respond to changes in architecture, such as exposure to ultraviolet light. In the event of a renovation, this might mean reawakening mycelium to colonize additional architectural elements, knitting together new and old into a continuous layer of thermal insulation; or following an earthquake, mycelia could be “switched on” to bridge gaps in insulation. At end of a building’s life, the fungi could be reawakened to decompose itself and bio-remediate other toxic building components. This would enable mycelium to carry out multiple roles—providing structure and insulation during the useful life of a building; and metabolizing toxic building components when the building is demolished. During the fabrication of the project, we used moisture as a design tool: moistening blocks to grow and bind them together; and drying the blocks to induce a dormant phase for the duration of the installation. Water is the most obvious mechanism to manage dormancy, but is clearly problematic in architectural applications: a small leak in a roof or imperfect building envelopes could be catastrophic. 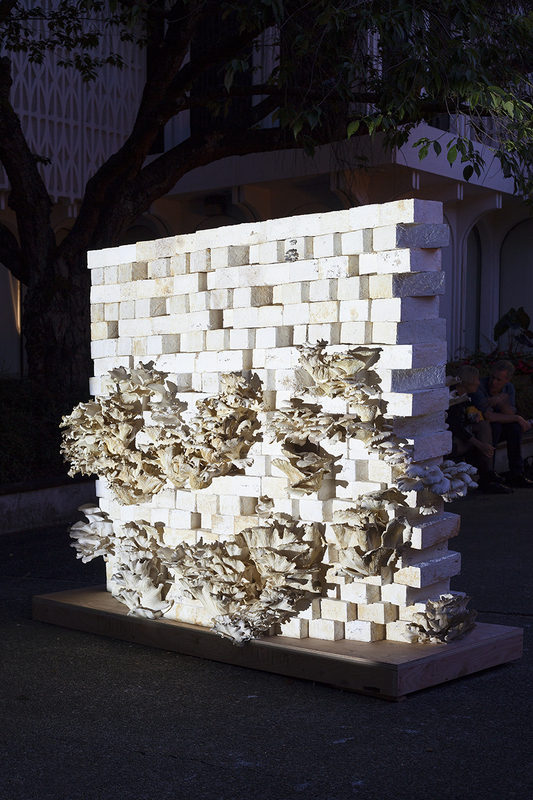 However, in the context of a temporary installation, the rehydration of dormant blocks at the end of the project signals new possibilities: it revitalizes the fungi, enables it to decompose the block form itself, and converts the once viable architectural material into a biologically available element once again. The first successful laboratory test growing discreet pieces together. Courtesy of AFJD. These potential developments promise a way around the catastrophic planetary consequences brought on by the current production of architectural materials like polystyrene. However, marshaling biotechnology runs the risk of unleashing far more serious effects if mismanaged. The utopian vision in which a building can be turned on to heal or digest itself at the end of its life must be weighed against the perhaps dystopian outcomes that have resulted from attempts to productively intervene in biological processes historically. Take, for example, Kudzu, which was introduced at the Philadelphia Centennial Exposition in 1876 as an erosion control measure. Kudzu quickly became known as “the vine that ate the south;” its unstoppable growth engulfed trees and buildings alike at a rate of one foot per day. Fabrication sequence of Mycelium Mockup, produced for the Museum of Vancouver, 2015. Courtesy of AFJD. We must be attentive to the unanticipated effects of intervention and innovation. 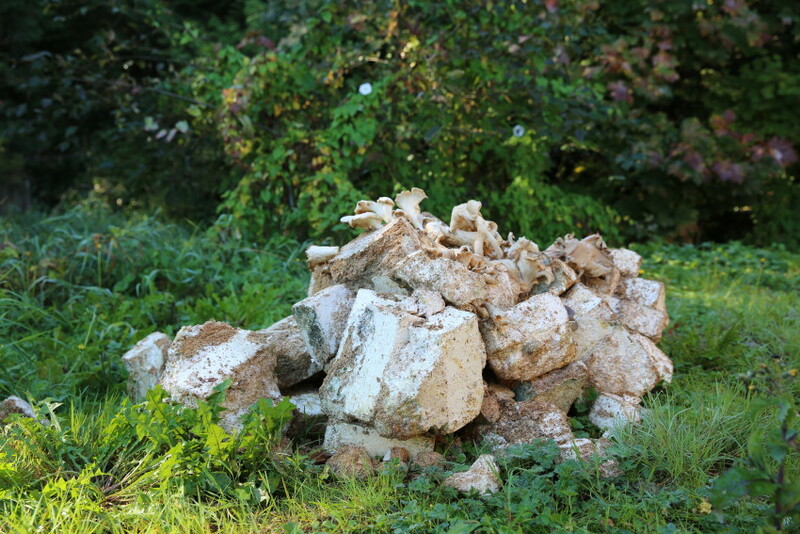 What potential havoc might intelligent mushrooms wreak on our cities and towns? 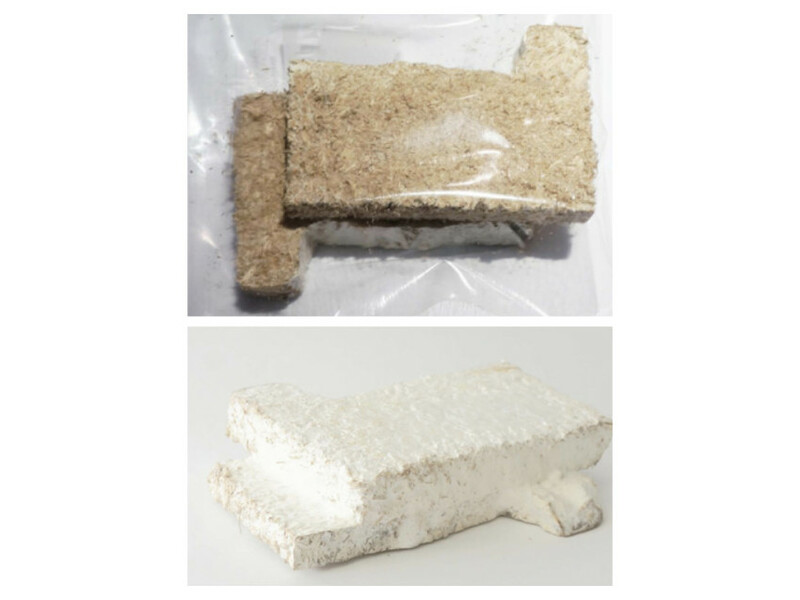 Mycelium-based insulation may promise the possibility of offsetting the harmful effects of polystyrene, but a truly positive impact is only possible if we consider the building and its surroundings as a complex ecosystem—characterized by a set of evolving relationships, similar to those that unfold in the natural succession of other habitats like flourishing forests or ponds. Detail view of Mycelium Mockup, Museum of Vancouver, 2015. 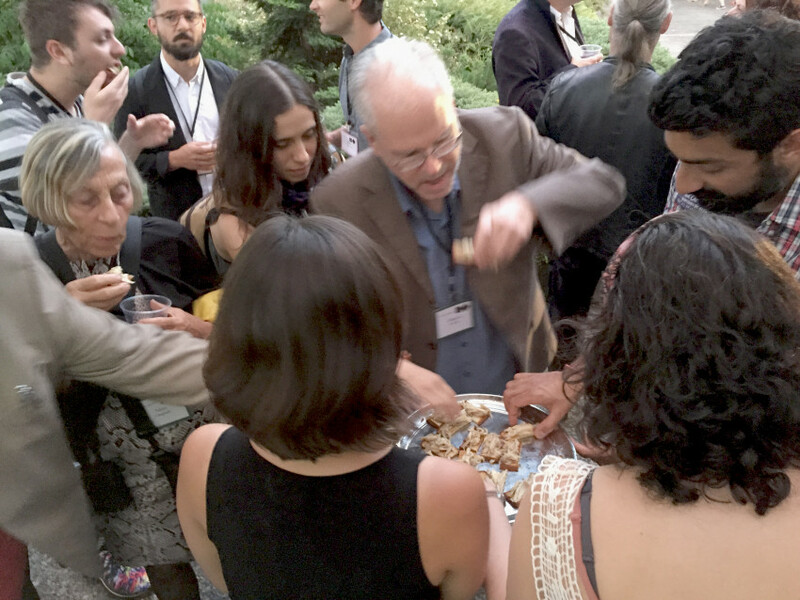 Part of the mushroom fruit was harvested and served to visitors as hors d’oeuvres during the installation to heighten the sensory and aesthetic experience of the material. Courtesy of AFJD. Mycelium Mockup, Museum of Vancouver, 2015. Courtesy of Joomi Seo. Mycobenches, 2016. Courtesy of AFJD. They Grow Without Us, Western Gallery, Western Washington University, Bellingham, WA, 2016. Courtesy of AFJD. Study for mushroom interior. Courtesy of AFJD. Mushroom pins forming on mycelium block. Mycelium Mockup fabrication, 2015. Courtesy of AFJD. 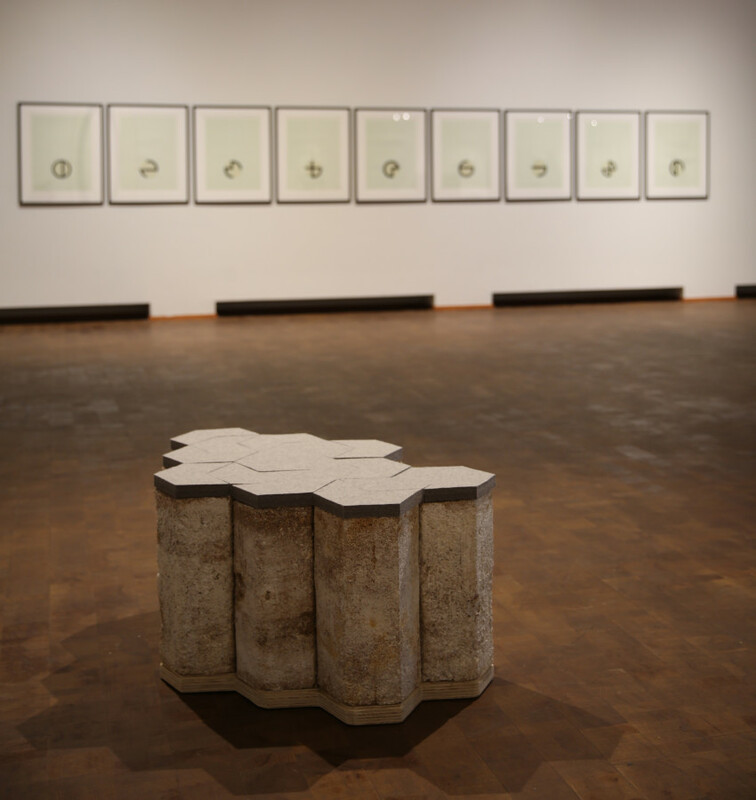 Post-Installation view, Mycelium Mockup, 2015. Courtesy of AFJD. Thinking about the development of architectural materials through the lens of biotechnological innovation allows us to ask new questions and to rethink architecture’s relationship to temporality. Most architectural materials are discarded long before their useful life is over, spending more time in landfills than in the form of a building. Sustainability in the context of rapid cycles of demolition and construction calls for more radically flexible and biodegradable materials. They Grow Without Us encodes organic decay into its basic structure, anticipating future demolition and using it as an opportunity to return valuable material to local ecosystems. In contrast to a relentless cycle of extractive consumption, They Grow Without Us imagines an alternate world in which dynamic and regenerative architectural materials provoke a transformation in design processes—one that attempts to more deeply understand the evolving and hybrid relationships between natural and anthropogenic materials and their epigenetic contingencies. Joseph Dahmen is a designer whose research explores emergent materials in hybrid ecologies. He is Assistant Professor at the University of British Columbia and a 2017 Wall Scholar at the Peter Wall Institute for Advanced Studies. He is co-founder of Watershed Materials, a sustainable architectural materials company funded by the National Science Foundation. He holds a Master of Architecture from the Massachusetts Institute of Technology, where he studied with Yung Ho Chang and John Ochsendorf. Amber Frid-Jimenez is an artist who explores the role of design and technology in contemporary society. She is Canada Research Chair and an associate professor at Emily Carr University, Vancouver, where she directs the Studio of Extensive Aesthetics. She has shown work at venues including the Casco Office for Art, Design and Theory, Jan van Eyck Academie, and the Vancouver Art Gallery in Vancouver. She holds a Masters in Media Arts and Sciences from the MIT Media Lab. AFJD (http://www.afjdstudio.net/) is a transdisciplinary design firm based in Vancouver positioned at the intersection of architecture and information design.